We only have 3 nominations so far and this is not enough to run the award. It’s your award, it will be a shame to loose it. Only 4 days left to send your nominations through…. Once again it’s time to send your nominations through for the Athletes’ Athlete award. Remember this is the only award selected on athletes’ votes and it’s your chance to say who has inspired you the most. Every year awards are given out to athletes based on performance, team contribution etc but this one is special it is your award, your chance to say who you think represents Athletics, this is the only award nominated and voted by athletes. Between now and the 21st December we would like your nominations. Each nomination should be accompanied by your reasons for the nomination and ideally a photo. Your reasons will be used in both the shortlisting process and in the main ballot, so please be as persuasive as you can! Nominations can come from you as an individual, or from a group of athletes. In addition, you can nominate both a male and female should you wish. Sarah Merritt, John Tilt and this is what was said about them. Very friendly and always gives a shout out to other athletes. I remember that Sarah Merritt gave me a shout out on my first run for the club. Since then she’s done so at every given opportunity and excitedly asks me about how it went afterwards. It really helps to have that kind of support in the club. Far from being just a supporter she has had a great run of top positions at road races and regularly enthusiastically throws herself into multiple events at track and field. She’s an all round class act and great representative of the sport. Not only is Jon a brilliant coach he is always willing to put himself out for the group and the club. This is through his positivity, encouragement and dedication. He’s a brilliant athlete always pushing himself to achieve the highest level of fitness and achievements. This in turn rubs off on his athletes making him a fantastic training partner. He can make even the hardest sessions bearable and enjoyable with that famous Jon Tilt smile. This entry was posted in Club News on December 17, 2018 by Tracey Jones. This entry was posted in Club News on September 16, 2018 by Richie Pearson. Sunday 4th November for Track and Field and Sunday 11th November 2018 for Starting and Starter’s Assistant and Timekeeping. Both days include a Health and Safety module which you must attend unless you have already attended. The cost is £30 for the discipline and Health and Safety or £20 for the discipline only. Full details and how to apply can be found on the attached flyer and a link to the EA website for course booking is also below. SAC will cover the full cost of the course if you commit to officiate for the club, if you let me know when you have been trained and I can add you to the distribution for next years fixtures. This entry was posted in Club News on September 13, 2018 by Tracey Jones. This entry was posted in Club News on August 23, 2018 by Nick Willson. Southampton ladies claim first vets league victory and join men in the finals! 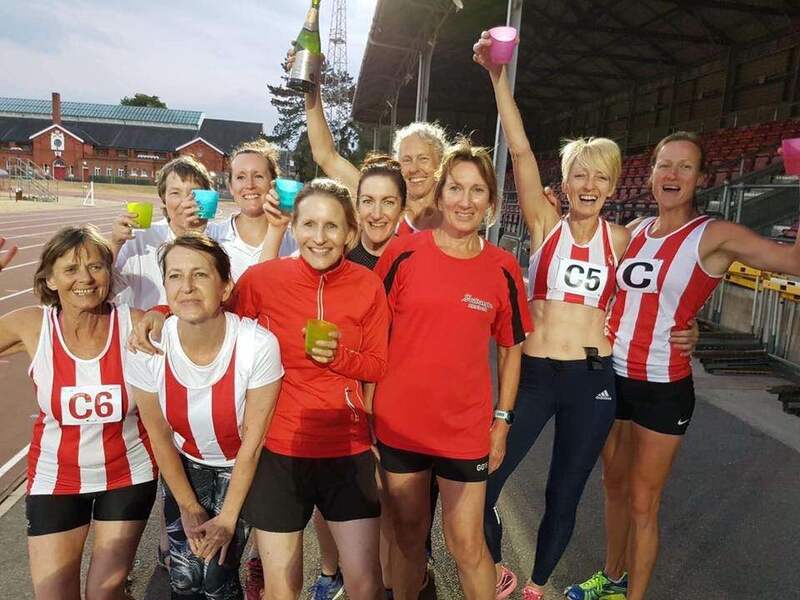 The Southampton AC ladies team made history in Aldershot last night, claiming a third successive victory in the Hampshire Vets League and securing the league win, for the first time ever. Coming top of the league that has been dominated by Winchester ladies in the recent past, means they have booked their place in the Southern Counties Vets finals in Ashford, Kent in September, joining the Southampton men’s team who have been regular visitors to the event. Despite missing key team players such as Nicci Blandford, Mary Axtell, and Dani Marshall, the team pulled together fantastically to beat 2nd place Winchester by 16 points. There were stand out performances by Joy Wright in the 200m (first in 27.8 seconds) and 800m (first in 2.34.2) as well as a personal best for Astrid Mangel in the long jump (2nd V60 with 2.56m). Joy also came 4th in the V35 discus with 19.19m. Tracy Bezance made a superb return from injury to win the V50 200m in 30.6 seconds. Janet Dickinson made a clean sweep of first places with victory in the V50 shot (9.00m), 200m B string (28.3 seconds), V50 discus (26.12m) and V50 long jump (4.53m). There was an excellent second place for Katy O’Dell in the V35 shot (8.34m) and Hannah Willson in the 2000m walk (12.41.6). Paola King came 4th in the walk with 14.54.8. Vicky Bright won the V50 pole vault with 1.20m and Claire MacErlean won the B string 800m in 2.41.0. Claire also secured second place in the 3000m with 11.27.0. Despite nursing a hamstring injury, Caroline Barnfield managed 6th in the V50 800m (3.51.8) and 5th in the V50 3000m (17.17.2). Hannah Willson, who was also helping with officiating on the night, came third in the B string 3000m with 12.35.7. Jane Pitt came 5th in her first ever timed 400m with 47.7 seconds. This entry was posted in Club News, Track Results on July 15, 2018 by Becky Mulley. If you are interested in applying just send me an email to: K.Drew@2016.ljmu.ac.ukand I will keep a note of all those who apply. I will then randomly pick 8-10 athletes to take part in the programme. This entry was posted in Club News on July 13, 2018 by Tracey Jones. This entry was posted in Club News on June 1, 2018 by Richie Pearson. Visit any of our 4 stores which stock the spikes and get ready for the season ahead! *** Enjoy 15% off spikes in store if you show them this email! This entry was posted in Club News on May 31, 2018 by Richie Pearson. This entry was posted in Club News on May 21, 2018 by Richie Pearson. Not only did the club’s athletes, coaches, parents and supporters see success at this weekends Hampshire Championships but the officials did well too. With positive feedback on the clubs officials and those being reported on Sunday received positive recommendations to advance in their officiating, Malcolm Wise to Level 2, Zoe Bond to Level 3 and John Stansfield taking the first step (1 of 6) towards possible Level 4. This entry was posted in Club News on May 13, 2018 by Tracey Jones.